The morning began early for the LEAP Ambassadors. We said goodbye to New York City and began our trek across the Empire State. Our first stop was the FDR Presidential Library and Museum. Franklin Delano Roosevelt was the first President to have such a library built in his honor. The museum was constructed on sixteen acres of land next to the Hudson River in Hyde Park, New York. It was designed by the President himself and the only library created for a President while in office. During its grand opening on June 30, 1941, the President humorously said that this would be the first and only time that admission would be free to the people. Upon entering, we were greeted by a statue of the President and his wife, Eleanor, sitting on a bench. The interior exhibits started with personal items such as childhood pictures, Franklin’s double basket side-saddle that he rode with his dog Fala, and a locket that belonged to Eleanor. the New Deal, and World War II. …and, ultimately, the end of the war. One smaller but interesting exhibit focused on his battle with polio and how he maintained an authoritative physique while the whole nation watched him. Part of the exhibition included an interactive item: a lever weighted to simulate the heavy steel braces the President had to wear. We were amazed and shocked by how heavy it was to lift the lever. It was no wonder his core remained in top physical form despite his illness. …during which he passed much of his agenda, while also setting the tone and establishing the momentum for the rest of his first term. As a bit foreshadowing, we saw Norman Rockwell prints related to FDR’s “Four Freedoms” Speech. This was of particular interest to us, because we are heading to Norman Rockwell’s studio tomorrow. Also of note is his original private home office, where he did much of his work. …and family paintings and portraits. We ended with our usual gift shop stop to check out souvenirs for our loved ones and friends back home. After leaving the FDR Library, we detoured slightly for a drive-by of another nearby monument. Although lesser-known, the Vanderbilt Mansion is not the slightest bit subtle. In fact, entry to the grounds requires a massive iron gate and a 20-foot-tall gate house. A blanket of snow rested upon the landscape as we puttered along the windy road leading up to it. Upon reaching the crest of the hill, a collective gasp was let out among the Ambassadors. The mansion is absolutely stunning. Construction occurred between 1896 and 1899. What stood before us at the end of a circle drive was a 44,000 square foot, 54 room Beaux-Arts monstrosity. Even though there were no tours of the mansion, and we didn’t have time to park the car to wander the grounds, we definitely did not regret the additional stopover. After a brief drive from the library, we arrived at the Massachusetts Museum of Contemporary Art. Mass MoCA’s outward appearance is quite deceiving. 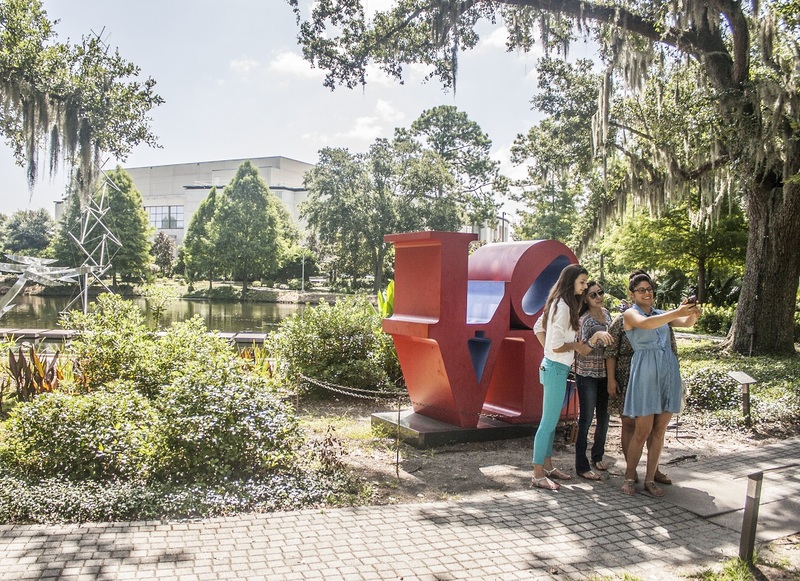 The campus embraces all forms of art: painting, film, light, sculpture, photography, and unheard-of genres that create new boundaries. The weather was frigid and windy, so we were especially eager to enjoy the museum’s warm confines. Inside, we were greeted by the gift shop and several galleries. Sol LeWitt was one of the featured artists, so his was the first we visited. Inside, entire walls were painted with a variety of colors and patterns – all pieces were completely different from one another and could be black and white or contain all colors from the rainbow. We took advantage of the fact that we could take pictures and left for the other main attraction: James Turrell. Turrell is especially significant for the Ambassadors because we have all seen his work in Austin at the University of Texas, as well as in Houston, and the organization has seen his work in numerous other places. The Mass MoCA exhibit was called “Into the Light” and was on two floors of a huge gallery of renovated-warehouse space. “Dissolve” is, like most of Turrell’s pieces at Mass MoCA, seemingly a projection on the wall that shows ever-changing patterns of color. The color changes are slow moving, so they’re quite beautiful and calming to look at, but, as you walk closer, you realize that there is no projection at all. The piece’s depth stems from there being an actual hole in the wall, lit from inside. Therefore, from the outside, you think you’re looking at a light projected on a flat wall, but what you’re actually seeing is light scintillating in a curved hole. This specific piece became a favorite for some of us for its constantly-changing color combinations and for its relaxing quality. The other upstairs installation was just as deceiving. When you walk in, it just seems like a white diamond projected into the corner of a room. Upon further inspection, however, it is yet another “trick-of-the-light.” This time, light is projected into the hole in the wall. We thought it was incredible especially since none of us knew it was a hole until investigating it closely. Seven more installations awaited us in another gallery, two of which had required advance reservations given space limitations. With each one, we were left with jaws agape. Turrell’s mastery of light manipulation leaves little competition. “Hind Sight (Dark Space)” was a complete mystery to us, as was intended, before witnessing it. So much so, that we needed to be instructed on how to properly navigate it. This is due to the fact that the installation is completely devoid of light. Only two were allowed in at a time. The entrance was a hallway with handrails on each side to which each person had to use while holding up one hand in front, using both to prevent running into walls. Victoria and I went in together and, almost immediately, I became too confident and smashed into the wall due to a sharp turn. At the end of the maze sat two chairs, one for each person. We were told that our eyes would adjust after 15 minutes and we would see what Turrell wanted us to see. Victoria and I sat, unable to see anything, in utter darkness, for what seemed like forever. Then, almost at the same time, we both began to see something. A gray figure materialized in front of us. We couldn’t see it when looking right at it, but we could see it out of our peripheral vision. It was interesting that Turrell, someone who specializes in light installations, created a piece that does not involve light at all. We left once our fifteen minutes were up and tried not to spoil it for the next two people who entered. The installation that absolutely flabbergasted all of us the most was “Perfectly Clear.” This installation encompassed an entire room we were to walk into. We were instructed by museum staff to wear shoe covers, not touch any of the walls, and not walk too far to the end of the room because there is a steep drop that probably would not feel good to tumble down. Inside, all of the white walls were bathed in blue light. Standing in amazement, we watched as the colors shifted to the next hue ever so slowly. Once our eyes adjusted, we could close them and see the complementing color to the one presented in the room (when the light was blue, the white waiting room appeared to be orange, etc.). At two points of our 10-minute session, a rapidly flashing strobe would play for 20 seconds. The hypnotic strobe light created patterns in our vision and left us dazed as we walked out of the room. Out of all of the impressive installations, all agreed this was the favorite. Additional adventures awaited us in the Museum. We had a chance to see another of our favorite artists: Anish Kapoor. Having seen his work in Houston, New Orleans, and Chicago (the famous “Bean,” or “Cloud Gate”), we saw another version today. Like the others, it also involved reflective surfaces. This is one we had a lot of fun with. …giving us a small sense of being home away from home. Our adventures for today done, all there was to do at the end of our endless day was to wander out into the grey light of the real day to make the drive to Albany and prep for more adventures in the morning. On our way to Albany, we passed through Vermont! For our usual readers, you may have noticed that we have left off our meals from this blog. We have a rule of sorts on our trips that we sample local fare and avoid nationwide chains wherever possible (well, more like unless in case of emergency!). On this day, we had much travel between cities and states to our various destinations, so most of our meals were on the road or obtained late in the evening. It probably isn’t fair to rate fare we selected given that our laps were doubling as our tables. That said, we’d like to give the Eveready Diner in Hyde Park, NY a shout-out for their awesome black & white cookies! It was the final day of our trip, and we wanted it to count as much as the previous days. 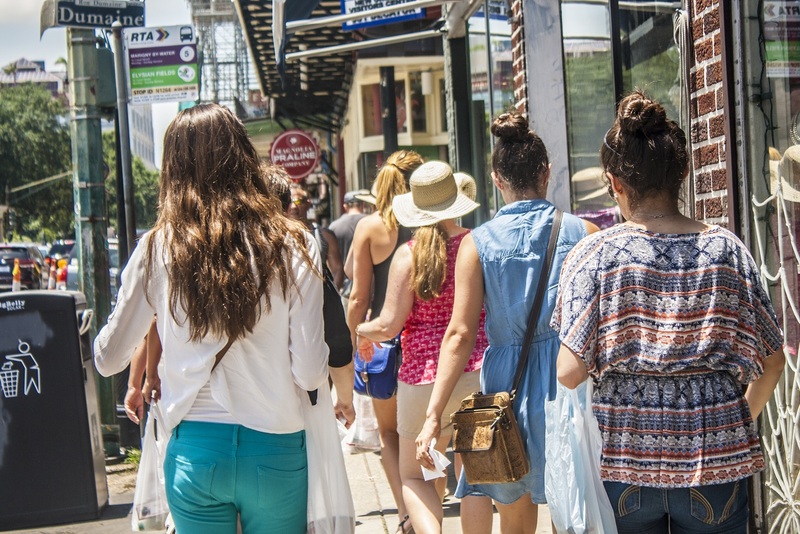 We began with a quick walk around the French Quarter, checking out the shops, restaurants, art galleries, all the things you don’t see in our home towns. 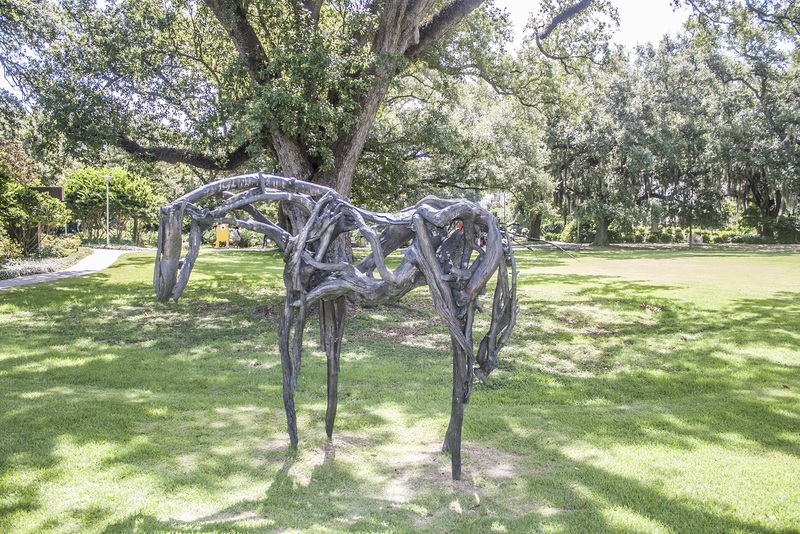 We then went to the New Orleans City Park, which houses the New Orleans Museum of Art and the Besthoff Sculpture Garden. It’s a wonderful city park, with jogging trails, playing fields, large oak trees, botanical gardens, a kids’ section, a mini-railway, a lake, and waterways. We explored the whole park briefly, then tackled the sculpture garden, which was beautiful and wonderfully interactive. 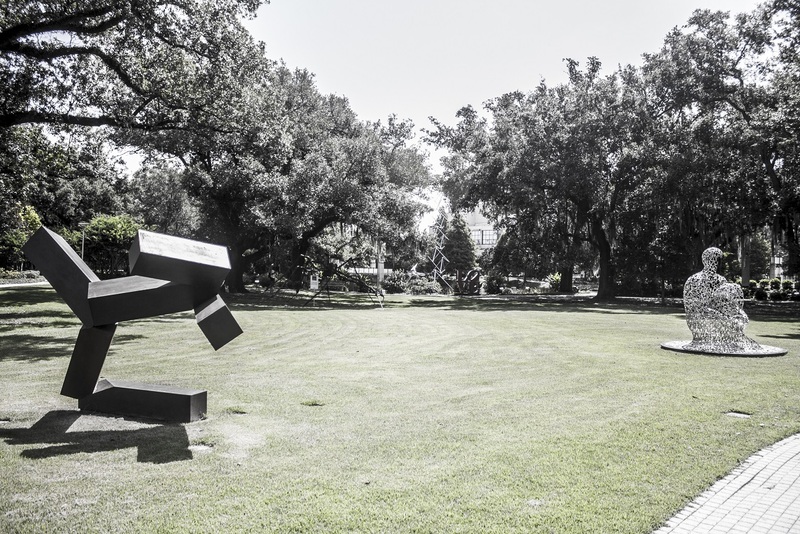 …we had seen his work in Birmingham, at UT when we traveled there in June, and of course at our own University, SHSU. But we don’t know a lot about art, so it’s an interesting find when we come across art we do know. 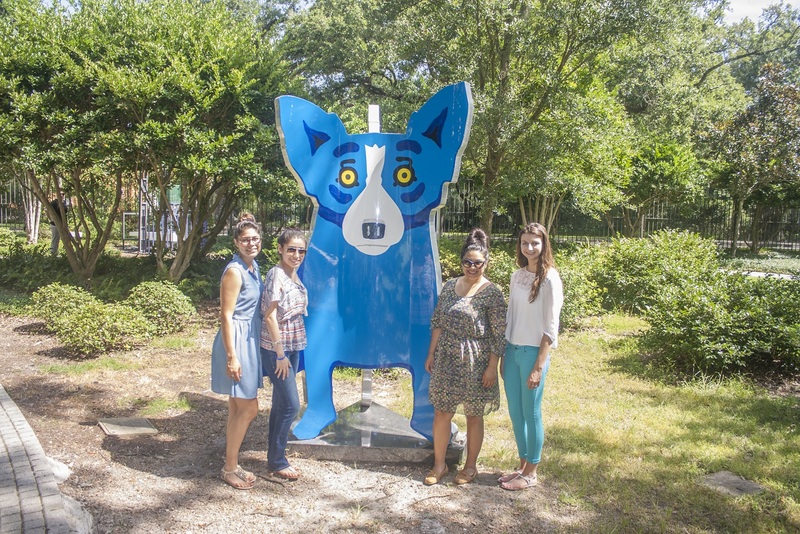 We also saw the “Blue Dog” by George Rodrigue, whose gallery we had seen the night before in New Orleans. …similar to one we had also seen at the University of Texas. Interestingly, when we drove around the Garden District, we saw one in someone’s front lawn! One of these pieces costs about $219,000, or about the cost of a nice home in Huntsville, Texas. 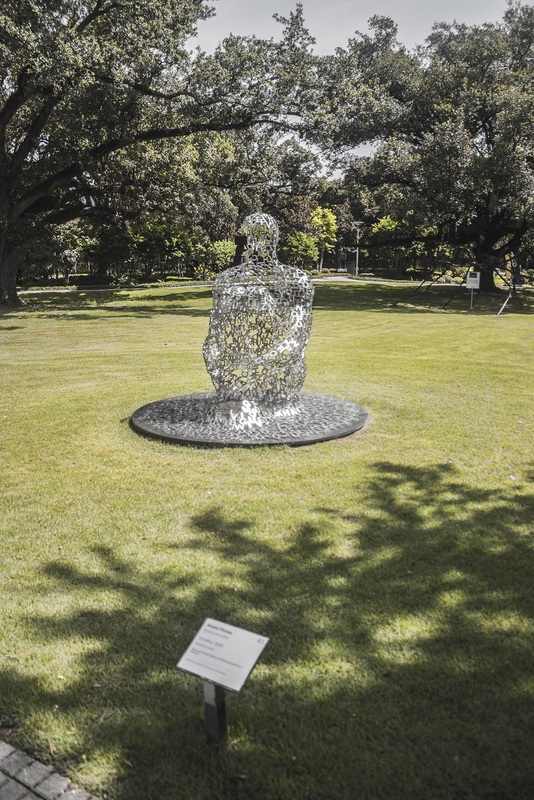 We also saw a piece by famous Spanish artist Jaume Plensa. This one was called “Overflow”…. 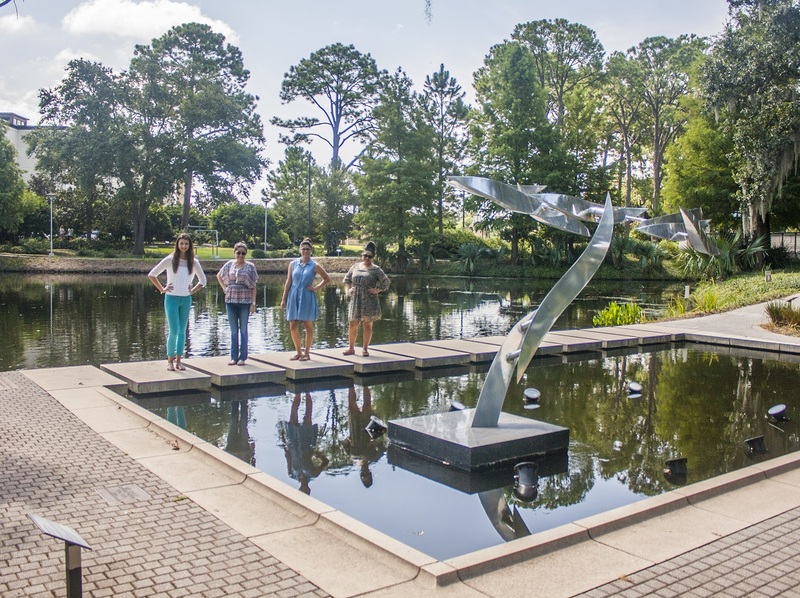 …but it is very similar to the set of sculptures he has around Buffalo Bayou in Houston, called “Tolerance.” Plemsa also did the “Crown Fountain” at Millennium Park. 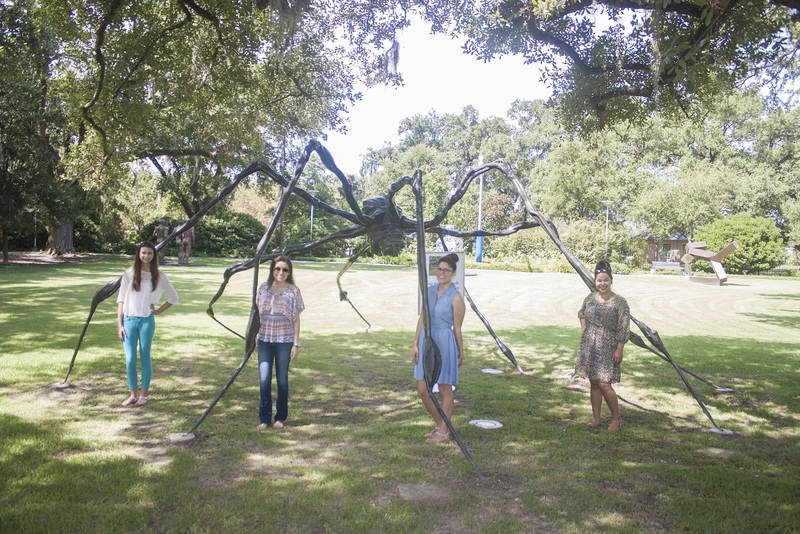 Finally, we saw work by Louise Bourgeois, who is famous for her large spiders. In passing, we saw works by Henry Moore, Rodin, George Segal, Anish Kapoor (who did “Cloud Gate” in Millennium Park) and Paul Manship. 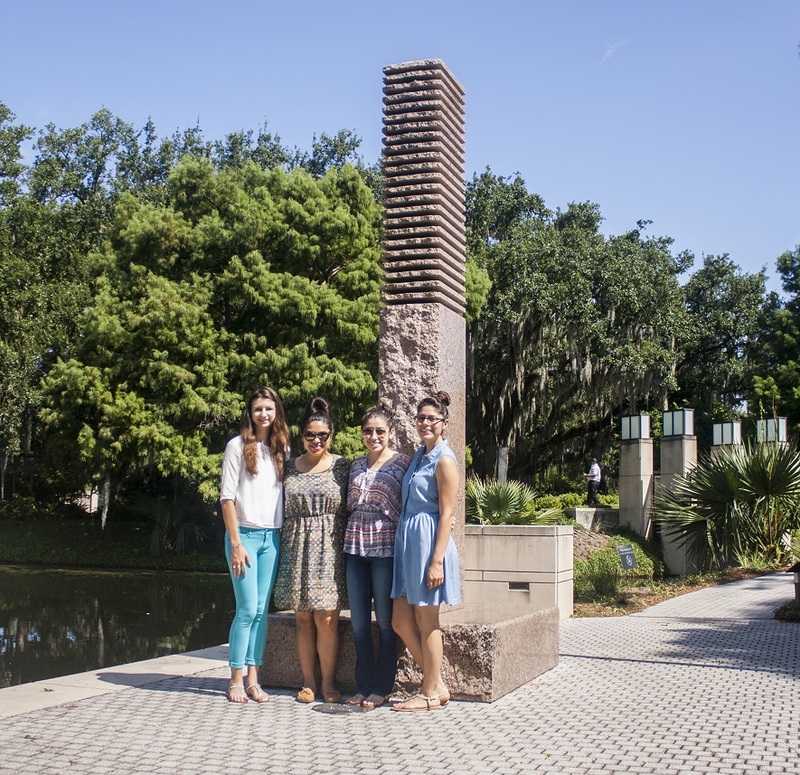 It was a fun and educational morning, and much more fun than a typical sculpture garden! 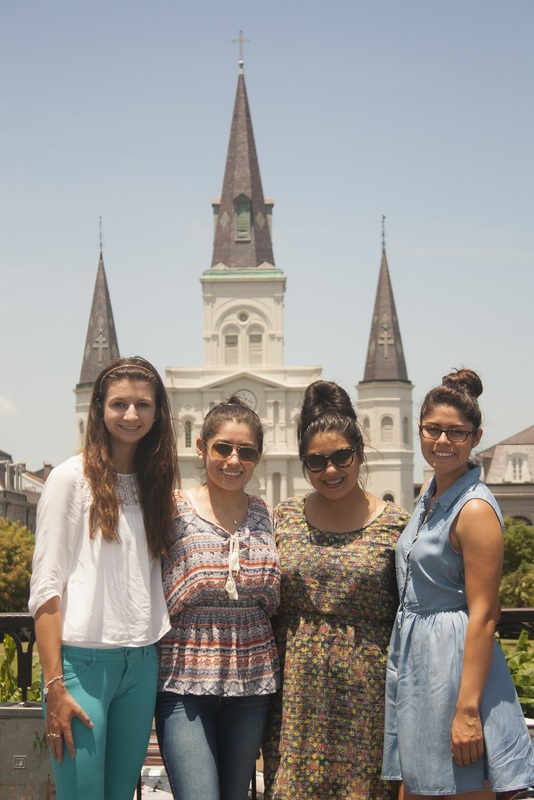 Following the art garden, we booked it back to the French Quarter and visited the market. 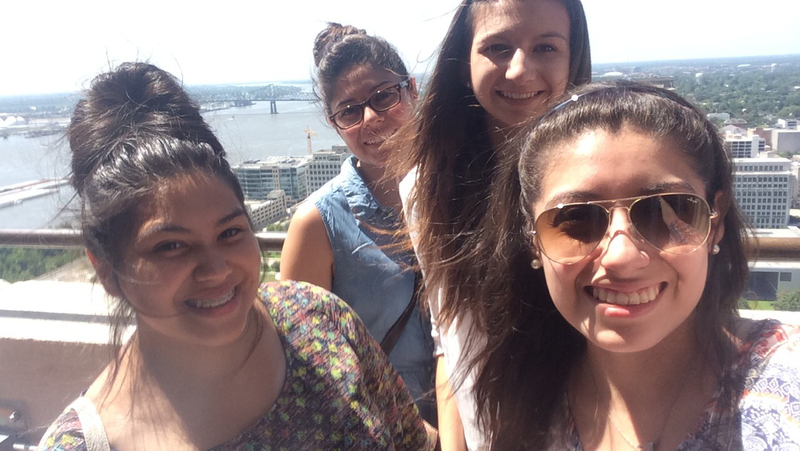 We mostly went our own ways, shopping and having lunch. 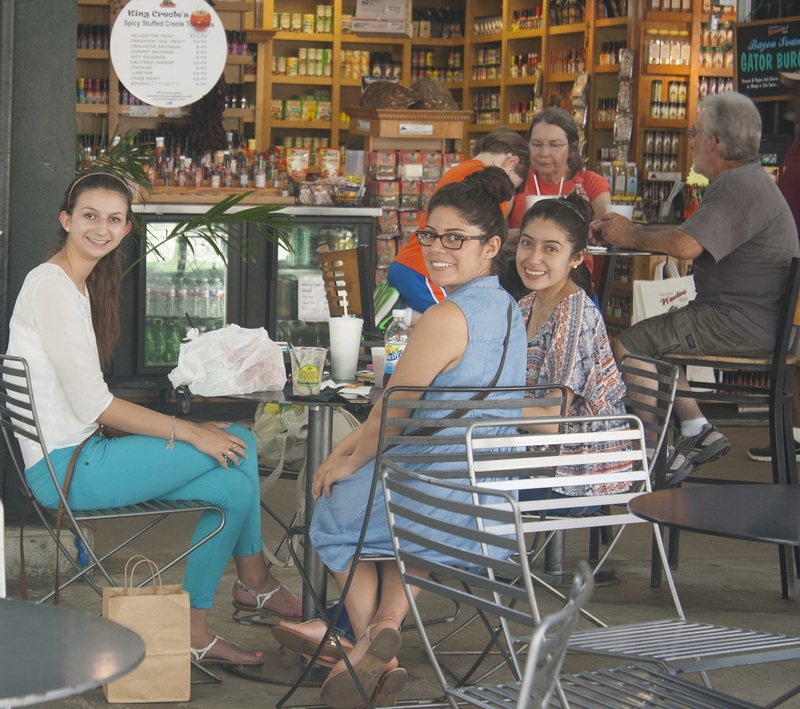 None of the food we tried really stood out, but it was functional and allowed us to maximize our time looking at shops and such, along with a final picture of Jackson Square. …and headed back to Huntsville–via Baton Rouge. 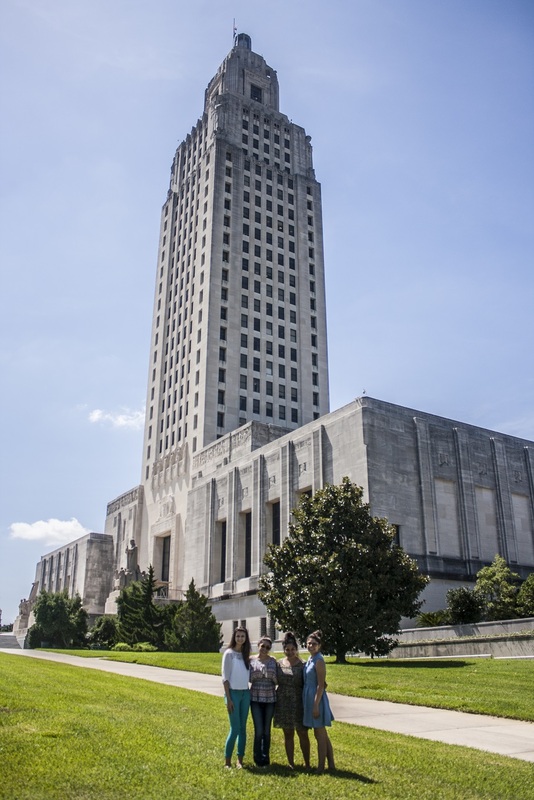 In Baton Rouge, we visited our fourth state capitol building of the trip. Amazingly, we (the students) had only visited the Texas capitol, so we each increased our total numbers of capitols visited by a factor of five! The Louisiana Capitol isn’t the prettiest one in the country, but it is the tallest. …it is the location of the Huey Long assassination. There is a small exhibit on the first floor marking the site of the assassination, along with some basic facts. One interesting item is that they aren’t entirely sure that the “assassin” killed Long. The Senator’s bodyguards fired dozens of bullets at the assassin, and it’s at least possible one of them killed the governor. One of the bullet holes is still visible in one of the marble columns. 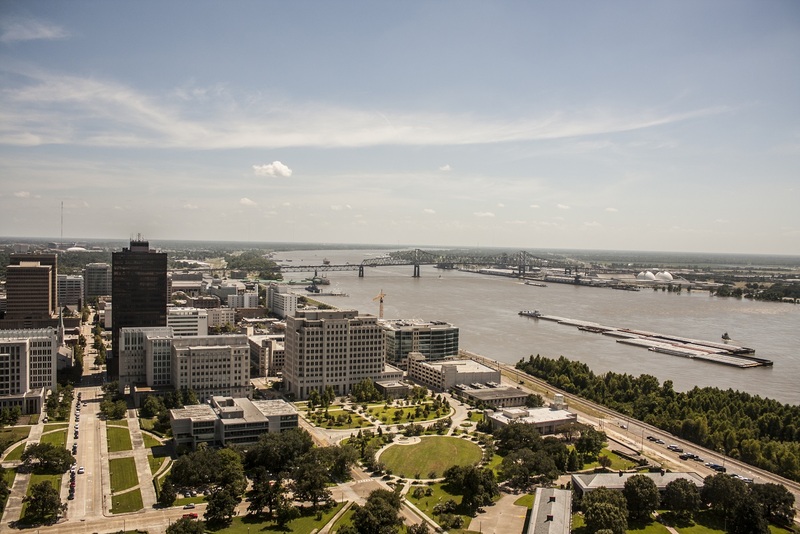 …which allows for good views of the aforementioned Mississippi, the armory, and the gardens. …was a fitting conclusion to a trip that gave us a similarly panoramic view of the south, its culture, and its politics.